Showing 7 articles from February 15, 2015. Traffic is flowing through Rock Crusher Hill - still with reduced speed, a permanent fix is scheduled this year at a cost of $7.3 million. 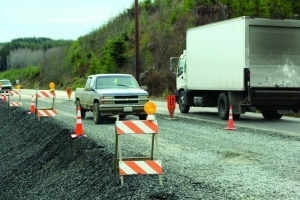 HIGHWAY 101 - Traffic passing through Rock Crusher Hill has again been opened to allow both lanes to travel simultaneously at the troublesome area at milepost 72.6. SOUTH BEND - The commissioners met Tuesday, February 10 for the bi-monthly Pacific County Commissioner's meeting. To kick the meeting off the commissioners modified the consent agenda by deferring one of the items to a later meeting, and then passing the modified agenda. Here they approved several simple things like the disposal of camera equipment for the assessor's office. Another important item on the consent agenda was the approval of the payroll for 174 employees for January 2015, which was $724,477. Residents of the city of Raymond can sit back and enjoy their water once again. From Left are Cami Swartz, Chloe Konigsberger, Adviser Mrs. Rohr and Ellie Sliva are ready to serve the residents of the Alder House at the Mad Hatter's Tea Party. 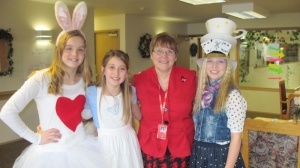 On February 2 three Willapa Valley FCCLA members hosted a Mad Hatter's Tea Party for the residents of Alder House and special invited guests. From left are Chris Rondon, Marissa Hurley, Chloe Konigsberger, Cami Swartz, Ellie Sliva, Claire Borg, Emilee Layman, Amber Anderson and Hallee Layman. 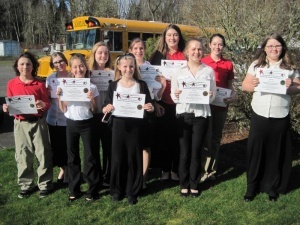 Last Thursday, 10 Willapa Valley Family, Career and Community Leaders of America (FCCLA) members competed in STAR Events (Students Taking Action with Recognition) in Toledo. The American Legion Raymond Post # 150 meets the first and third Wednesdays of each month at 7 p.m. A potluck dinner, beginning at 6:15 p.m. precedes the first meeting. The legion auxiliary also meets at 7 p.m. on the third Wednesday of each month.